Turmeric is a powerful herbal remedy that hails from the ancient Ayurvedic system of medicine. 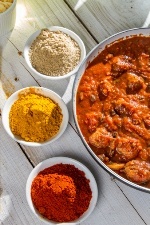 It is the central spice for curries, and it has been long linked to a variety of health promises. A new health breakthrough illustrates just how strong it might be — it can take down a devastating virus. Turmeric’s medicinal component is called “curcumin.” If you read about either of them, you’re essentially reading about the same substance. Incredibly, researchers found that turmeric stopped the potentially deadly Rift Valley Fever virus from multiplying in infected cells. This virus affects mainly animals, but also humans — but that is beside the point. The thrust of the study lays in the sheer might of this herb. PLUS: Can curcumin protect your memory? In India, turmeric is a common medicine that people take for infections. On these shores, its rise to the top ranks of alternative medicine is pretty obvious at this point. The researchers plan to know test 10 types of curcumin to see which works best. Evidently, the virus-fighting abilities can flow in a wide number of areas, as viruses are a predominant source of disease around the world. Science is transforming the spice from folk medicine to one that could help a patient’s body fight off a virus. How: it stops the virus from invading health cells and it could be applied to a wide array of viruses. When a virus attacks, it tricks human cells into not responding to the infection, thwarting the immune system. Turmeric may interfere with this. For Rift Valley Fever, and Venezuelan Equine Encephalitis (another virus it was found to fight), flu-like systems can make it hard to recover. The body usually starts with an exaggerated inflammatory response because it doesn’t know where to start to rid itself of the virus. The body will go overboard in its response, not a good thing, as it could influence cells around the infection. That is one way the virus can spread, as the way the body’s response contributes to it. The curcumin angle is sparking some research into a family of viruses that includes, notably, HIV. Researchers want to figure out why and how a virus affects the patient. Why are certain cells more susceptible? In the end, curcumin could be part of therapies that defeat the viruses. Find turmeric or curcumin in any health store. And if you haven’t heard of it before, chances are this won’t be the last time.